People seem to go on strike in Naples all the time, which adds to the feel that nobody actually works around here. It is usually just a minor inconvenience for a few, but this week has been pretty outrageous. Truckers are on strike this week. I’ve gotten all kinds of updates from the base about road and highway exit blocks. At first I heard that trucks would block off many highway exits, so getting to where you need to go might be a challenge…like be cautious when driving past them as you do exit or try to avoid them all together. Then they posted a picture of what the blocks actually look like now. Not quite what I expected, but there is certainly no way to drive around these guys. Everyone is talking about how they were going to get home and around as well as how the school busses would be taking kids home…any non-highway street is twisty, backwards, weird, and impossible to navigate, even with a GPS, but that’s the only way to go this week. I’m glad I live close to wherever I need to go and that I ride a bike! 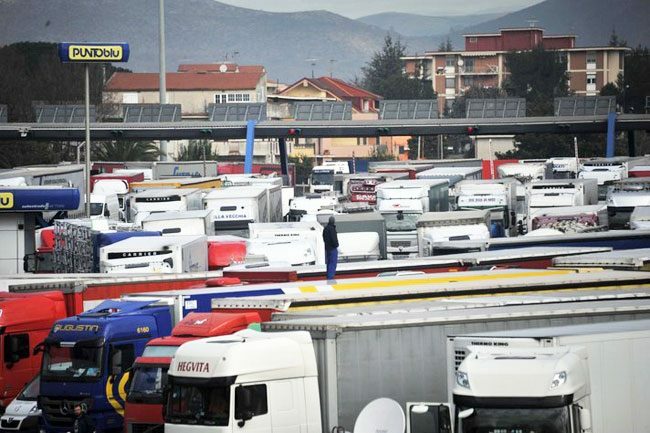 A1 Napoli Nord toll booth in Caserta, blocked in both directions, picture taken from US Naval Support Activity, Naples, Italy on Facebook, January 2012.